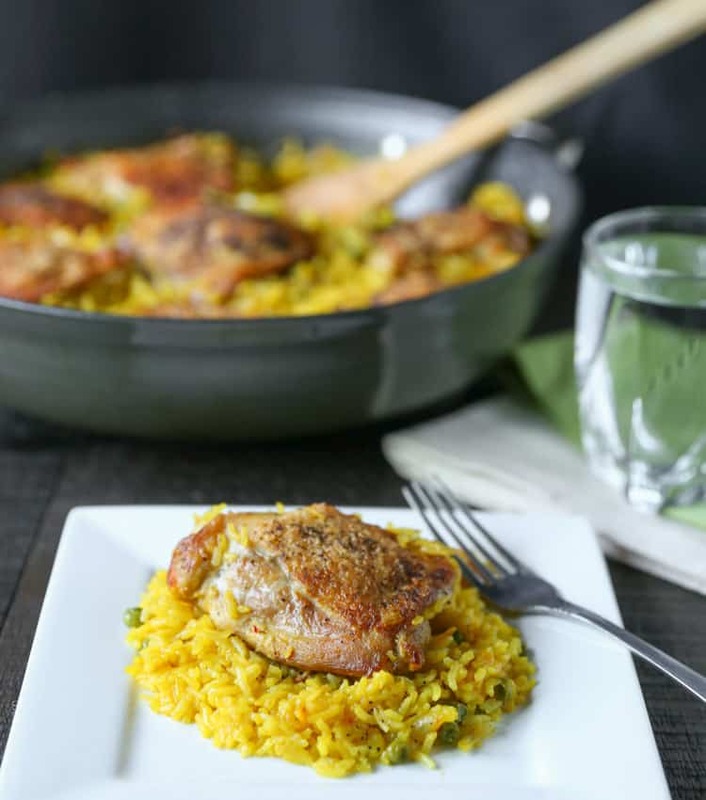 Easy 1 pan meal of bone-in skin-on crispy chicken thighs cooked in a savory saffron rice. Flavorful, warm and ideal for a crisp fall weeknight dinner. The temperatures here in California have dropped to about 65 degrees, which is about as frigid as I like it. It has cooled down so much that I now only sleep with my window half open, instead of all the way open. I’ve even busted out my Ugg boots. Well, actually they’re fUgg boots (fake Ugg boots). Have you guys tried the Costco brand ones? I swear, I cannot tell the difference! Actually, I can. Because Costco only charges $40 compared to Ugg charging $195. So I don’t have to have a heart attack when a little bit of water or olive oil spills on them. So they feel even comfier since I can really relax in them. Highly recommend. So now that your feet are warm and toasty, let me show you how to make my brand new number 1 favorite meal for fall. 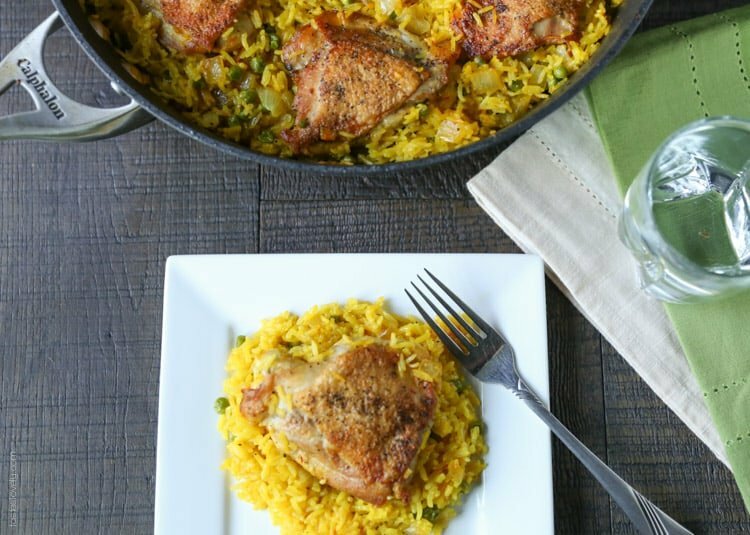 This chicken and saffron rice skillet is a-mazing. First of all, you must start cooking more chicken thighs. You must! Not only are they cheap cheap cheap (I got 3 lbs for $3 athankyou), but they have much more flavor than a chicken breast. 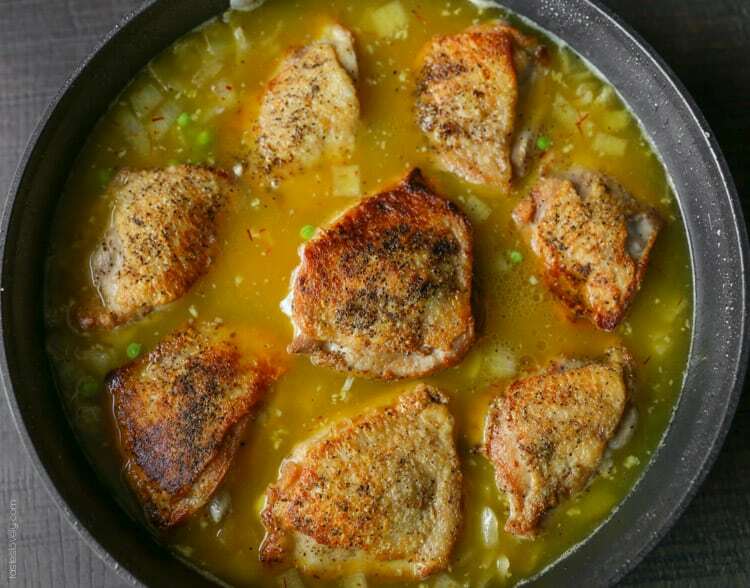 And since you’re saving money by using chicken thighs, it’s ok to splurge a little on saffron. A little tip, Trader Joe’s just started carrying saffron at the best price I’ve seen in stores. You get a whopping .02oz for $5.99. Ok, well, maybe not whopping, but it’s all you need. Oh saffron, how can you be so delicious? 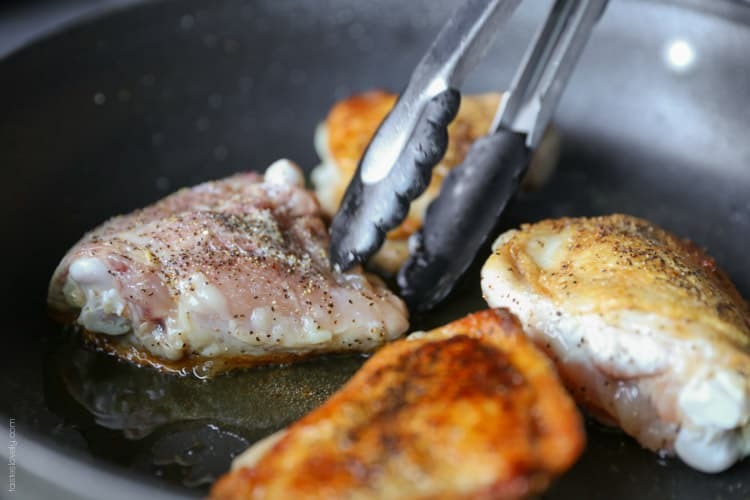 Start by heating up 1/2 tsp of olive oil in your biggest non-stick straight-sided oven-safe skillet. I’m in love with my 6 quart Calphalon pan, perfect for this meal. 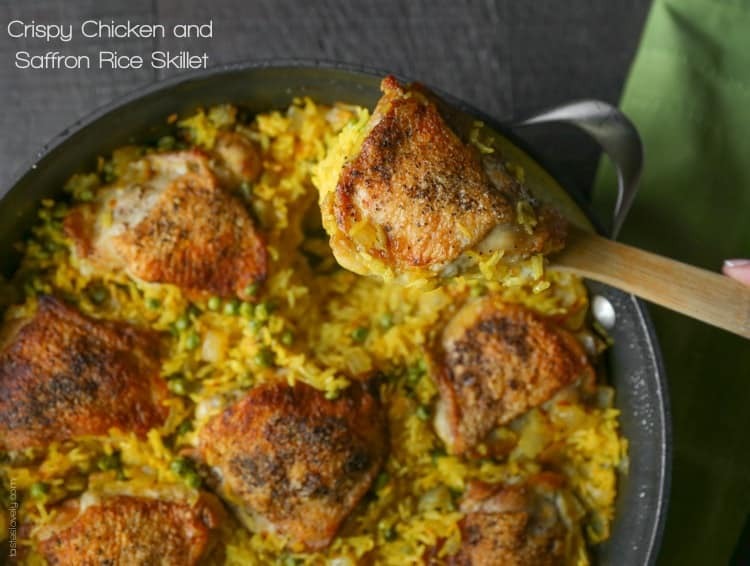 If you don’t have something big enough (roughly 13″ across and 2″ deep) just cook the chicken and prep the rice in any pan, then assemble the “skillet” in a 9×13″ baking dish. Will turn out just the same. Cook the chicken thighs 4 at a time over high heat until they are nice and golden brown, about 4 minutes per side. 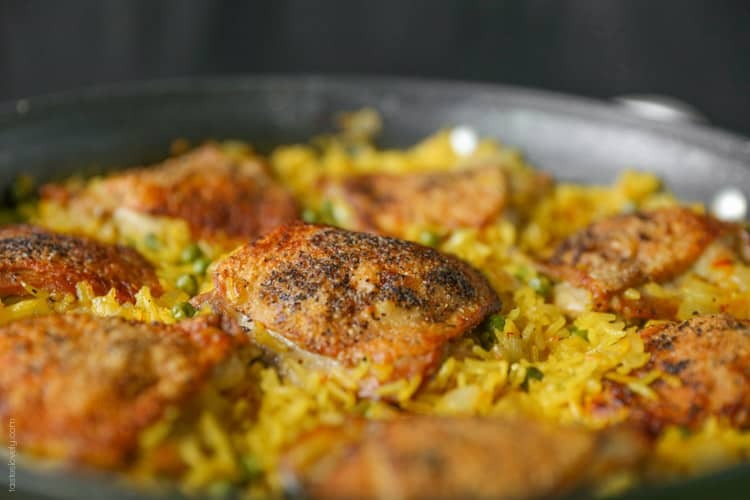 Transfer the chicken thighs to a platter to rest while you get the rice ready. Discard all but 1 tsp fat from the pan. Add in the onions and cook until they just start to turn translucent, about 5 minutes. 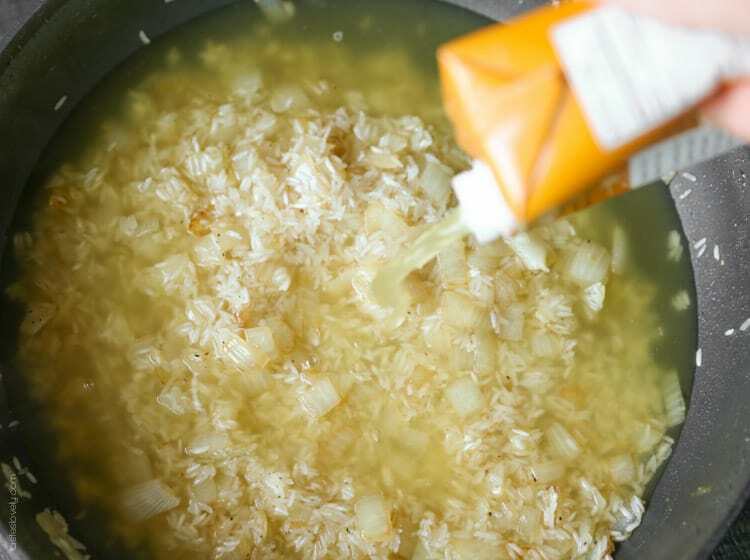 Add in the garlic and cook for 1 minute until it is fragrant. Next add 2 cups of white rice. Add in 4 cups chicken broth. Now it’s time for the star ingredient…saffron! So red and beautiful. Add in about a gram of saffron (I only had .7 grams since that’s the amount Trader Joe’s sells). Break it up in your fingers as you sprinkle it in to release the oils in the spice. 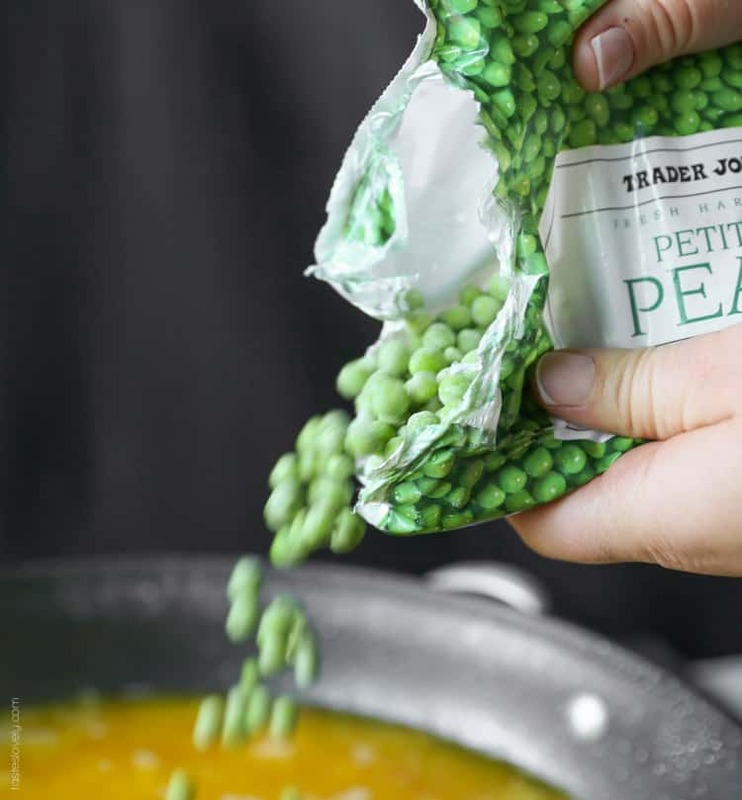 Then add in 1 cup of frozen peas. And 1 tsp salt. Stir to combine. 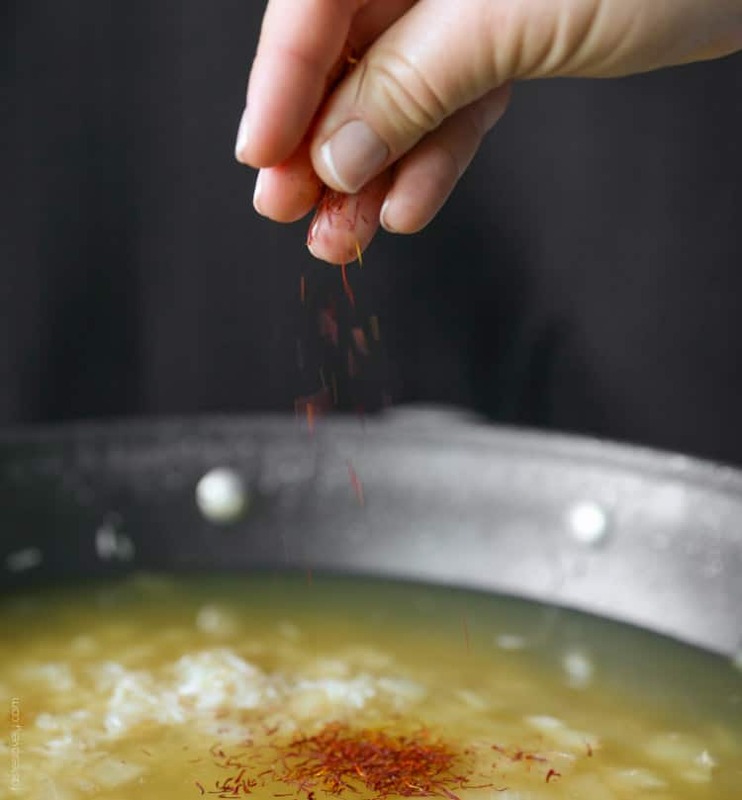 The saffron turns the broth into a beautiful deep golden color. Add the chicken thighs back in. Put them skin side up. This is important! Otherwise, the skin won’t stay crispy. Cook in a preheated 450 degree oven until the rice has absorbed all the liquid and the chicken is cooked through, about 35 minutes. Let rest for 5 minutes before serving, then dig in! Just wait until you hear the crunch from that crispy chicken. And the rice? Delicious. Oh. My. Yum. You are going to love this. My husband loved this so much the first time I made it for him he gave me a kiss after his first bite even though his mouth was full, so I knew it was a winner. 1. Preheat oven to 450 degrees, and preheat your largest non-stick oven-safe skillet (13″ across and 2″ deep) over high heat for 2 minutes. 2. Dry chicken thighs well, and trim of excess skin and fat. Salt and pepper both sides generously. 3. Cook the thighs in batches of 4 at a time, starting with the skin side down, over high heat until deep golden brown, about 4 minutes per side. 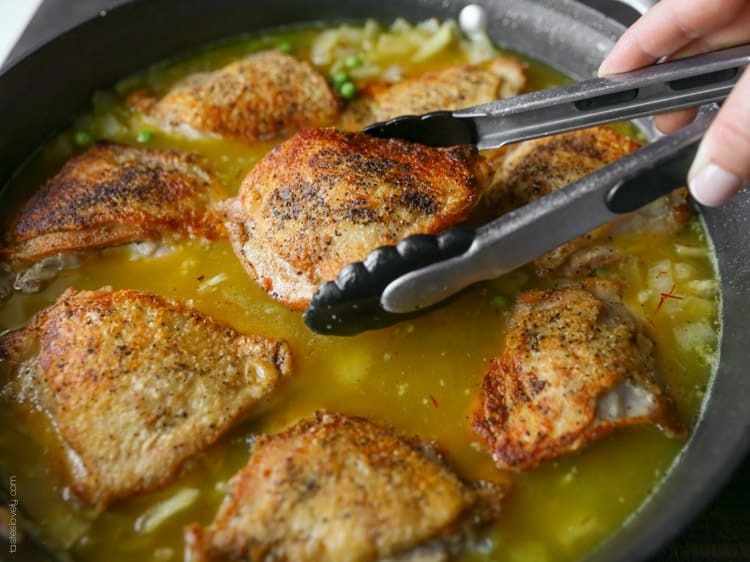 Transfer chicken thighs to a plate. 4. Discard all but 1 tsp of fat. Add in chopped onion and cook until just turning translucent, about 5 minutes. Add in garlic and cook until fragrant, 1 minute. 5. 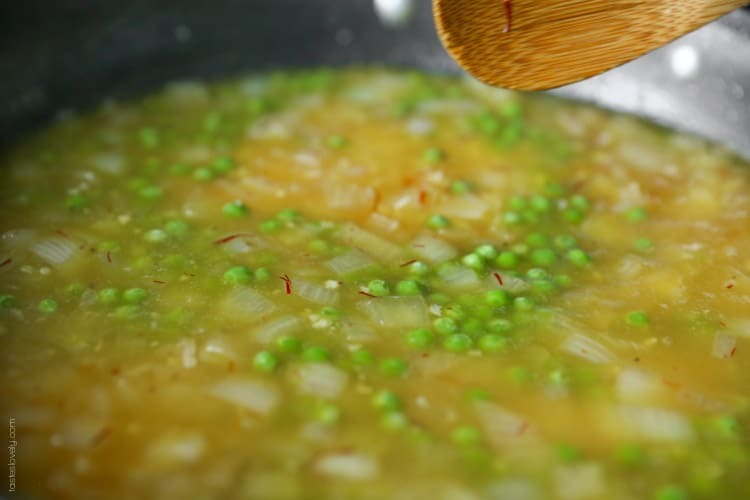 Stir in 2 cups of white rice, then 4 cups of chicken broth, 1 gram saffron, 1 cup of peas and 1 tsp salt. Return skillet to heat until the liquid just starts to boil. 6. Add in chicken thighs skin side up. Put skillet in the oven and cook uncovered until all the liquid is absorbed and the chicken is cooked through, about 35 minutes. 7. Remove from oven, allow to rest for 5 minutes before serving. 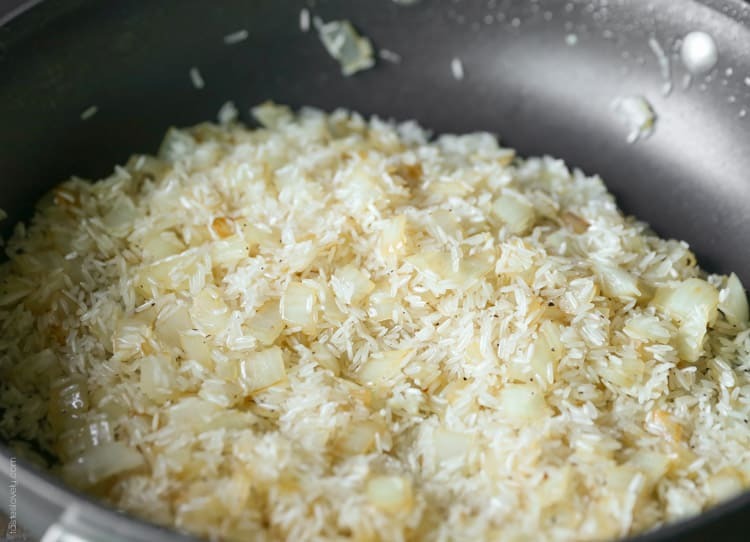 If you don’t have a large enough oven safe skillet, follow directions as normal, but after rice and liquid has reached boiling, transfer rice and liquid to a large 9×13 baking dish and put chicken skin side up on top of rice mixture. Follow the rest of the directions as written. Also, the nutritional info is for 1 chicken thigh and 1 cup of rice, but realistically I usually eat 2 thighs. It’s just too good! Thanks Caitlin! You’re so organized already having saffron on hand. You’re gonna love it, and especially love only having to clean 1 pan. I made this….It was bland…I have good saffron…But it didnt have that crazy good Indian flavor? Ok. This looks absolutely delicious!! I cannot wait to make this. Thanks for sharing. Yum! This looks amazing! My family would love it. I’m in CT and I’ve dragged out my Uggs too. I hated spending all that money on them but they were worth it because I live in them this time of year. But I’m all for saving money so I gotta check out those Costco ones. I love, love, love this dish. Everything about it. It’s easy, cheap, and looks mad tasty. Definitely have to make this one! Thanks for the compliments too! This dish is very loveable, hope you make it someday! This recipe sounds easy and quick. Fortunately I have saffron from Morocco. I am making it on Saturday for my movie group night. I will let you know what they think. I wonder if a bit of cumin would go well with this. I bet yours will be extra good with saffron from Morocco! I hope you loved it! Movie group night sounds like a blast! I bet cumin would be delicious too. I want to try that next time! Saffron continues to allude me because I refuse to put down the $$. You are tempting me now…. Any suggestions as to what can be put in place of saffron? I used saffron but I also tried it with turmeric and smoked paprika and garlic. It turned out delicious too. Ooooh, all that sounds delicious! I’m going to try that next time I make this. Glad you liked it Meredith! Thanks Ashley, you’re so sweet! This looks absolutely delicious — I love saffron with rice. It really gives the rice such depth of flavour! this looks sooo delicious..my mouth is watering…. seriously love the flavors in this! that crispy chicken skin is calling my name! Thanks Julie! Is there anything better than chicken with crispy chicken? Good recipes, I really enjoyed the part when you discussed. This looks just awesome! 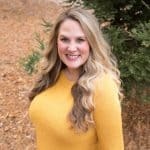 Great blog…keep it up! I’m so happy that I found your page. Thank you so much Kristina! It is such a delicious dish, one of my favorites. I love it even more because it’s so easy to make. Just brown the chicken and throw everything in the pot and let the oven do the work. I hope your family loves it! I’m happy you found my blog too. Have a great rest of your week! Do you cook the rice first ? Hi! So I am making this recipe in the oven right now…is it really a whole gram of saffron? My first time cooking with it and from articles I read it says that is a lot. I’m scaref I put too much now! Hi Vanessa! Yup, a whole gram of saffron. I buy the little container from Trader Joe’s and use the whole thing. Perfect amount of flavor. 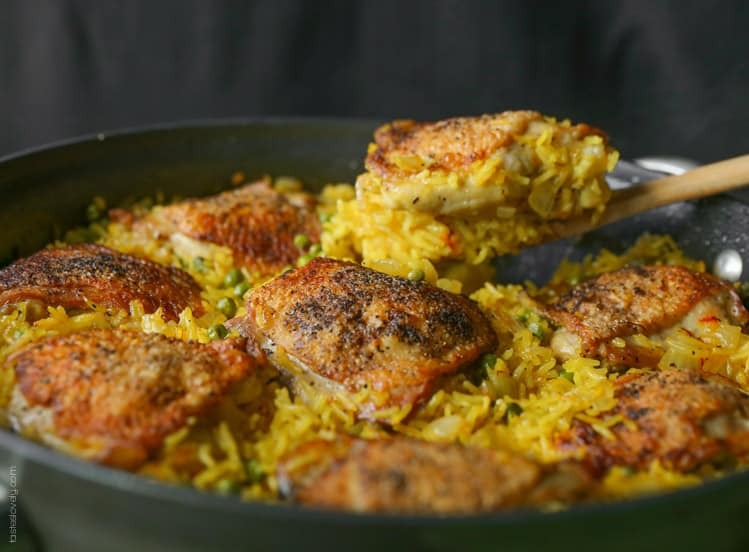 Keep in mind the chicken and rice is pretty “bland”, so the saffron gives it its flavor. I hope you like it! One of my favorite dinners! Perfect for a cold January night. It was beautiful! We really enjoyed it! Thank you so much for your lovely recipe…and for responding so promptly on the one gram of saffron! Hope you have a lovely evening as well! Help! 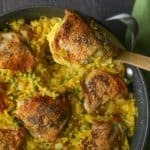 I want to love this recipe, it was so easy to make and made enough for leftovers, but something went wrong with my rice. Now, I only had 1/2 gram of saffron, so I know next time I need more, but the rice was greasy and tasted like what I think was fat. How can I prevent that? Just need more saffron? Willing to try again. I am good at messing recipes up, sometimes I just need to try again! Hi Danielle! Sorry the recipe didn’t work out perfect for you the first time, but I love your determination! 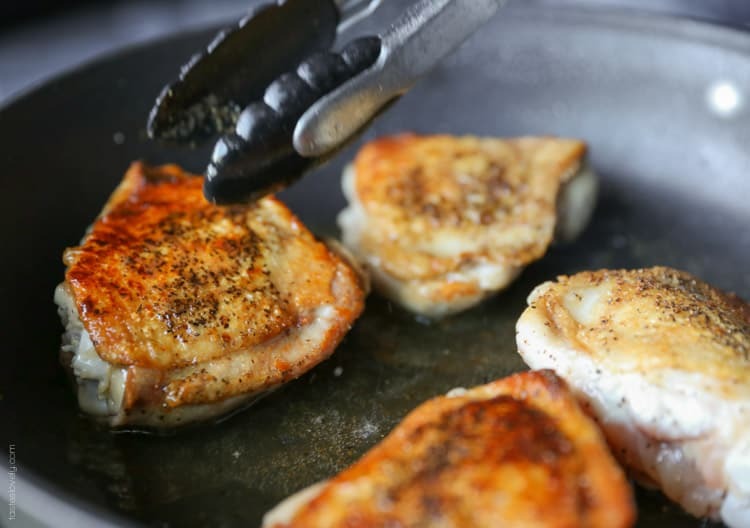 Maybe your chicken thighs had a lot of fat? Before I cook the chicken thighs, I cut off as much fat as possible. Any “white” parts stuck to the chicken. I’ll even lift up the skin if necessary. I didn’t mention that in the recipe, so this is partly my fault. Sorry friend! 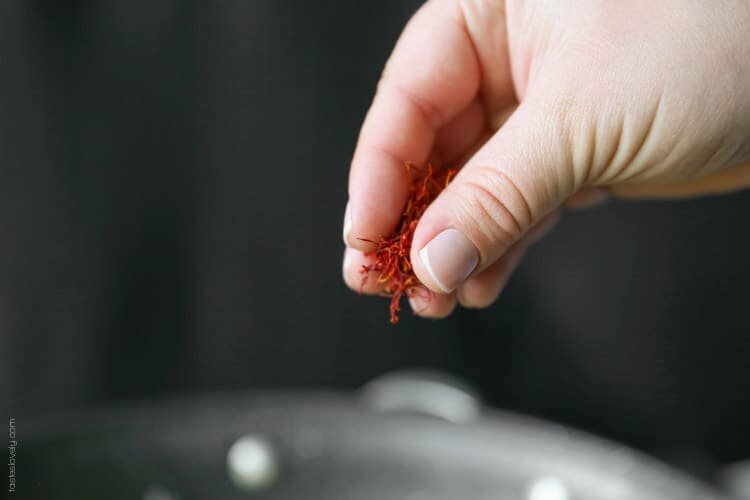 I also use 1 gram of saffron, which gives it a warm, scented flavor. So maybe the extra saffron adds more flavor to the rice? Does any of that sound like it could help? If not, let me know! Happy to recipe trouble shoot with you Danielle! I had bought some saffron and was searching for a chicken recipe to try… I used chicken breasts because that is what I already had in the house and left my onion pieces pretty large (for the picky eater to avoid more easily), but those were the only changes. This was super-delicious!!! The leftovers were fantastic lunches for work, too. Thank you for sharing!!! I am so happy to hear that Angel! 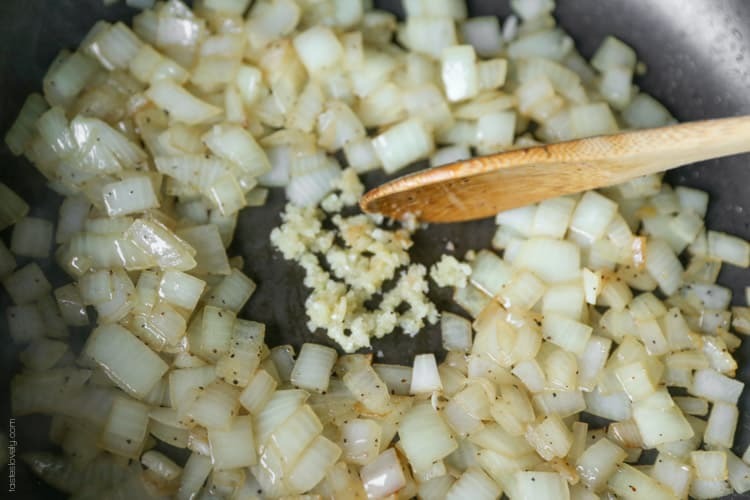 And great idea using chicken breasts, and bigger chunks of onions so the picky eater can eat around it. Thank you for taking the time to comment and tell me how much you liked my recipe. Means the WORLD to me! Hugs! OMG, so delish! I cooked this for my hubby and close friend tonight and it was a huge success! Cooked this on a hot, humid spring evening in Georgia, so this meal works year-round (and I’m originally from northern CA and I know about 65 degree cold weather, lol). Thank you for the wonderful recipe. Going to try this with shrimp and mussels next! Any suggestions on how to incorporate seafood into this dish? Thanks :-). I am so happy to hear that! Thank you SO much for taking the time to let me know, you just made my day! This is such a great recipe for a dinner party. Especially since the oven does most of the work for you. More time for you to socialize! This would be great with seafood too! But seafood cooks up a lot faster than the chicken. I would probably add the shrimp/scallops/mussels/chuncks of fish during the last 10 minutes of cooking. Give the rice a stir, then mix in the seafood. I think 10 minutes of cooking time should be just about right. If I ever try it I’ll let you know how it goes! Great idea! I am making this recipe for the second time right now. I can’t afford saffron at the moment so I used Mahatma saffron rice instead, but it came out wonderfully last time. Love it! This time I added mushrooms, we’ll see how it tastes. I am so happy to hear that Miranda! And isn’t saffron crazy expensive? For just the tiniest little bit! I bet it tasted great with the Mahatma saffron rice. That’s a great tip! And love your idea of using mushrooms. I’ll have to try that next time. Thanks for letting me know, you just made my day! Natalie: Cooked the recipe for my wife and she loved it. We use saffron in Paella it’s the best spice I have. When I lived in the middle east I got hooked on it. We cannot get the #1 rated saffron because it is grown in Iraq. But I found a company that imports from Afghanistan and I think I paid $100 for 1 OZ. It taste 10 time better than trader Joes. Can I sub water for broth? Yes, you can sub water for broth. It won’t have quite as much chicken flavor, but will still taste just fine! Where do I buy saffron from? I actually found it at Walmart in the ethnic foods section. They have a separate little spices section in that aisle and it is in there. Oh, good to know! I’ll have to look there. Thanks Nora! I’m so glad you like the recipe. I just made this 2 weeks ago. Still a big favorite in my house! Amazing quick Tuesday night paella!! Used saffron rice packets (Vigo brand) and less water than original recipe. Red pepper instead of peas and cooked them with the onions! Increased garlic to 5-6 cloves! Used 5 skinless chicken thighs. Added 10-12 shrimp the last 7 minutes of cooking to top. Defrosted the shrimp in 1.5 cups of chicken broth. Bc I originally made 4 cups for original recipe. 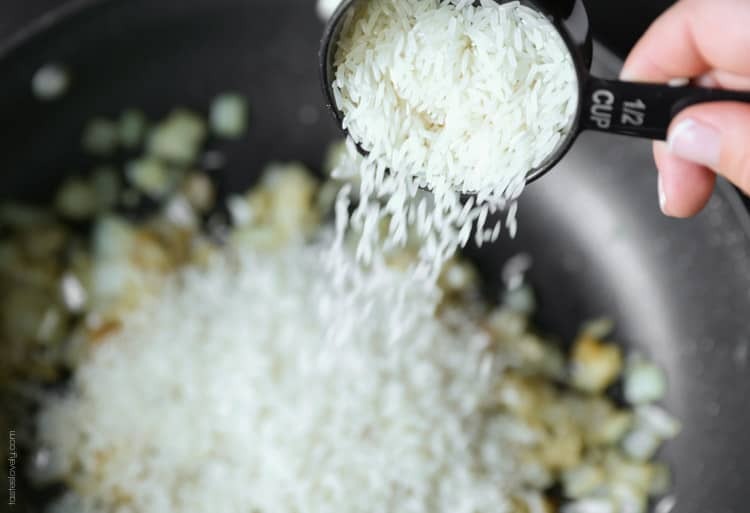 Don’t shorten cooking time despite what it looks like, unless you don’t want the bottom “crust” on the rice. Used 2.5 cups chicken broth with the (2) 5 oz saffron rice packets And still added 1gram saffron. Added half a lemon juice at the end and then served with 1/4 lemon per person. Turned out amazing!! Yea! So glad you liked it Emily! And I love all the adjustments you made. I want to add shrimp to mine next time too. Thanks for taking the time to let me know you like my recipe, means the world! This was absolutely delicious. Made it last Saturday for my daughter-in-law’s birthday. Very easy to do. Thanks. Substitute arborio, (better yet, Spanish calispara or bomba rice), for the white rice. 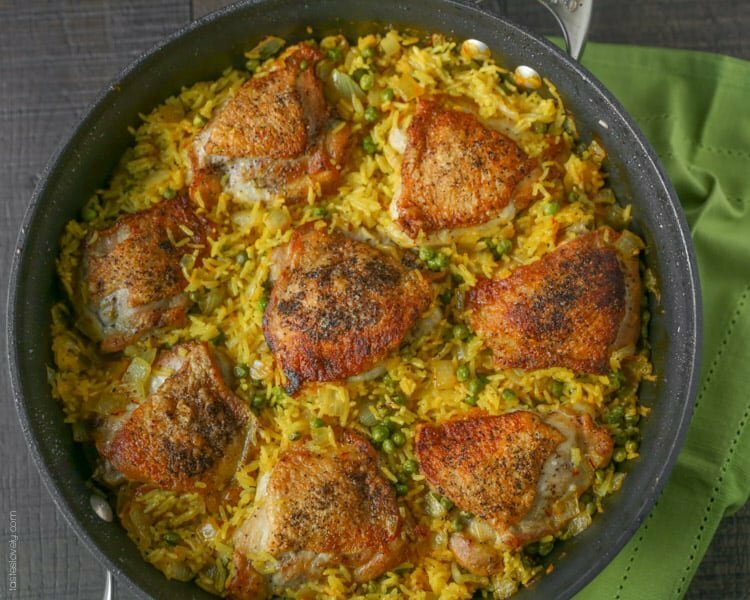 And, you are making Spanish “arroz con pollo”. Yum! Would this recipe also work on the stove-top? I’m staying at a friends’ house where I’m not sure if the oven fully works. Hi Elisa, I’ve never made it on the stove top, but I imagine it would work just fine! Just cover the pan and cook for probably the same amount of time, until the rice is cooked through and the chicken has an internal temp of 165º. Looks good and delicious the only change I made was I grinded about a pinch and a 1/2 saffron in a mortar then let it steep in 1/4 cup of Hot not boiling water 5 minutes. Once you add the stock add the saffron water in as well and then sprinkle some strands on top and bake as normal. By the way I used saffron from Herat, Afghanistan from soldier friends. Great recipe!! Made this last night and it turned out delicious! I used boneless thighs and half the rice because we aren’t huge rice eaters. Loved it! I’d been searching for a recipe to use some saffron my husband bought in and stumbled upon this one. The chicken was fabulous with the crispy skin. Thanks so much for the recipe. I’m so glad you liked it Clarissa! Thanks for letting me know you liked my recipe, you made my day! Girl, I tried this and fell in love. It was easy and tasted sooo good!. Thank you!! Yea! So glad you liked it! So flavorful and delicious, right? Thanks! LOVE this recipe and it was a big hit with my family, especially because my husband and oldest son are very picky eaters. Will definitely fix for future dinners! Yea! This made my day Joanne! So glad your family loved it! Isn’t it delicious? Glad you found me! And thanks for letting me know you liked my recipe, this made my day! Thank you for sharing this! It came out exactly as the photos suggested and the whole family loved it! I’m so glad to hear that Harold! Thank you! Such as amazing rice i would love to make it . I’m planning on making half of this recipe tonight. Will the recipe still work with 2 chicken breast’s boneless with no skin? I know it’s not going to be crispy like the recipe but will it take the same amount of time and all? Yes! It will still work great! Hope you love it!